As far as good writing goes, usually the devil is in the details. When writing about the present, many authors usually try to draw from personal experience. Some authors go to length to experience really dangerous and awkward situations to be able to depict them accurately in their stories. That can be a challenge but it is not impossible. Things get tougher when writing about the past. Here one can't rely on personal experiences unless some day time travel becomes a reality. So the writer has to depend on second hand information. He has to pore over numerous accounts regarding the period of time he is covering in his story to get a mental image of how things would have been in those times. Wherever details are not there, he has to fill up the gaps with consistent assumptions. Now how about the future? That too not the near future but really distant future! This is the task faced by writers of science fiction. Different writers deal with this differently. Easiest way is to keep the narrative sketchy. Another way is to keep most of the things same as current times but add futurist elements in some aspects alone. A third alternative is to go full throttle but hope the reader would forgive them for internal inconsistencies. It takes a real master to take up all the aspects of environment, society, economy, politics, technology, culture and social values and extrapolate them into the distant future in full detail and weave a story around them. The one master who has accomplished this is Frank Herbert in his Dune series – a magnum opus indeed! The Dune series is a modern epic in its own right. 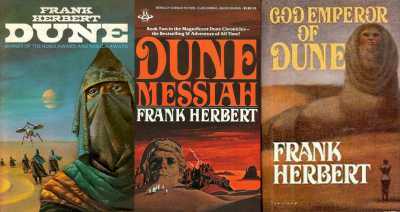 Frank Herbert can proudly stand alongside Homer and Veda Vyasa. The Dune series is set far into the future by when the human race is expected to have broken away from earth and expanded across the universe. The six volumes of the Dune series span over thousands of years. The main focus is on a particular planet called Arrakis and its exotic ecological system. The fate of the whole universe depends on a substance called mélange spice that is produced only on Arrakis, making Arrakis the virtual center of the universe. The story has lot of interesting communities which use the mélange in different ways. The Bene Gesserit, an order of women who play an influential role in the story, uses it to activate memories of their ancestors. The spacing guild that controls all the interplanetary transport uses it to see the near future, which helps them to predict accidents and prevent them. The Tleilaxu use it for their genetic experiments. There are many more fascinating communities in the book such as the Suk doctors, the swordmasters on Ginaz, the Ixians, the Fremen etc each with their unique culture and specialties. The book follows the fortunes of the Atreides dynasty that rules over Arrakis and the influence they have on the universe. The book is full of intrigue and political plots and subplots as the different dynasties and communities struggle for dominance over the universe. There are four elements that make this book exceptional – the imagination, the level of detail, the characterization and the overall philosophical undercurrent. Let us go over them one by one. As far as science fiction and fantasy go, imagination is more of a hygiene factor than a differentiator. However in terms of the extent of imagination one must say Frank Herbert towers over the rest. The book is full of mind blowing concepts. The possibility of our cells storing the memories of all our ancestors and the possibility of waking these memories and accessing them is one such concept. Then there are many concepts related to war craft, space travel, breeding programs, seeing the future, reincarnating the dead from their cells etc. Talking of the details, they have been perfected to the minutest level on almost every aspect. It is almost like a real history book in its level of detail. When we want to check the quality of a digital image, we enlarge a small detail and see how it comes out. That is what Kenneth Anderson and Frank Herbert’s son Brian Herbert has done to some background details from the main Dune series. They have taken these elements and expanded them into complete novels.Even they make really interesting reads like how in a high resolution image even small details show really well when enlarged. This goes to show how much thought he has put into every little aspect. Even though the books are really large and six of them in the original series, nowhere does the book unnecessarily meander and fill space with fluff. On the contrary, the basic premise in the six books had provided material for more than a dozen other interesting sequel, prequel and interquel novels. Usually one area where most science fiction is weak in is characterization. Science Fiction Authors get so carried away with technology and its overall impact on human society that they end up ignoring individuals. But Frank Herbert has managed to create some amazingly complex characters. The dilemmas they face, their hopes, their fears, their anxieties and insecurities make really interesting read. The heroes tower large at one point and then suddenly seem all so vulnerable. A hero in one book turns villain in the next. We see the key characters from various angles, from the vantage points of their own mind, through the minds of others, as a neutral observer seeing them in action and from posterity when the story has moved on a few centuries.That is almost every possible angle one can conceive of. Though a lot of importance is given to the heroes, there are numerous secondary characters of varying importance that we get to know personally and relate with. The whole books is scattered with gems like these. The reader would be able to relate with many of these in the contemporary context as well. The best part is that the quotes and philosophy blend seamlessly with the main story line. The story actually reinforces the ideas. So books in fact would make a very interesting read for someone who wants to understand politics and power struggles in general as well. Overall I would rate this series as one of the best I have ever read. However I would not recommend for children and the very casual reader. A new reader starting the series might get totally lost in the complexity of the Dune universe. One has to persist in order to reap the rewards. Also one cannot afford to quickly skim through the book. I would recommend the reader to go over each huge tome patiently, relishing every line. I did that and at the end of it I was so hooked on to the Dune universe that I eagerly gulped down all the books written by Brian Herbert and Kevin Anderson as well even though they are possible not even shadows of the original works by Frank Herbert. Foundation series is much easier than Dune and the Ender series is an even more easier read. Will be putting up those in the coming weeks. How much did the own-domain cost? Look forward to more science fiction posts from you! Thank Mahesh. It cost only 600 Rs. Look forward to your regular visits. That is definitely my intention in starting this blog, Jayahree. One of the very few works of fiction where a re-read actually gives you more than the first read. I, too, rate Frank Herbert far above any other author I have read. Indeed, Suresh. One series to be read again and again. Even Foundation feels stale once you have read it once. Recently I bought all six original Dune series books written by Frank Herbert. I completed few weeks back first book(Dune) in the series - loved it. Will definitely read rest of the books. I did notice you had reviewed Dune on your blog last week. Karthik, I have a feeling I've read this post of yours before. You have captured the spirit and the theme of the expansive Dune series in a nutshell. It has been one of my regrets not to be able to read it. Richness, details, characters and philosophy are not alien to science fiction. Margaret Atwood's Oryx and Crake trilogy is another brilliant example. Thanks Umashankar. You are right. This post was moved from my other blog. I haven't read Margaret Atwood yet. Must try her. This is just the tip of the iceberg, Pankti. The book has much more than this. Thanks moonstone. It is actually worth it, Even I was daunted by size and number of books in this series. But once I started reading, it was so amazing. It is one series I have read 3-4 times and found something new every time. I have to get my hands on this book. Have been looking for it since the past couple of years and your review makes me want it bad. You must Medha. It is worth it. And it is not too difficult to get hold of a copy.